Highlights include return of composer Mason Bates and local music collaboration. Former lead singer of punk band Avail, now a solo artist, Tim Barry speaks at a press conference for the Richmond Symphony today. 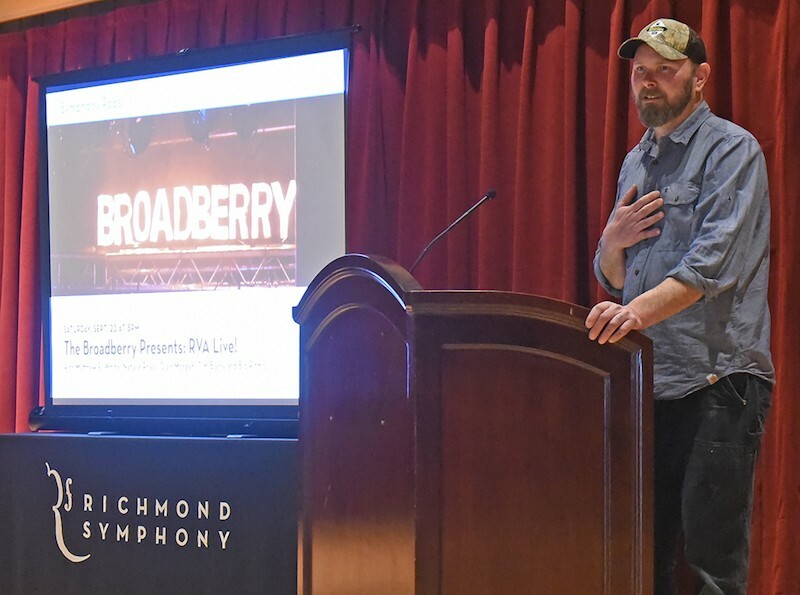 It's not every day that you see punk folk musician Tim Barry speak at a press conference for the Richmond Symphony. But that was only one of the surprises announced at Rhythm Hall on Tuesday, when the Symphony set out its plans for an impressive 60th anniversary season. Barry spoke briefly about his participation in a unique concert that the Symphony is holding Sept. 23 titled “RVA Live!” at the Dominion Arts Center’s Carpenter Theatre. The concert will feature symphonic collaborations with local music luminaries Matthew E. White, Natalie Prass, Bio Ritmo, Barry and Clair Morgan with curatorial help from Lucas Fritz of the Broadberry -- which will be throwing the after-party. Orchestrations for the "RVA Live!" show will be created by Trey Pollard (Spacebomb Records), Marlysse Simmons and Toby Whitaker. Barry told Style later that he hadn't decided which of his songs he will perform, but that they'll be from his solo catalog. He's excited about the process "and so is my dad," he says, joking. He says he has one song in mind that's an open letter to Richmond. Another big highlight of the season is the May 2018 return of Richmond-raised composer Mason Bates, who will perform a world premiere commission with the Richmond Symphony Chorus. Bates, a St. Christopher's graduate, is known for pushing the boundaries of classical music by incorporating electronic music. Opening night of the season features popular Chinese pianist, Lang Lang, with Stephen Smith conducting this Sept. 14. Another unusual show takes place Oct. 28 with a performance by classically trained string trio Time for Three. Those who buy a season subscription can bring anyone younger than 17 free to shows, which Executive Director David Fisk notes is part of a mission to expose younger generations to classical music. He also hints at news to come about more big-tent shows. Symphony officials also highlighted casual local series, including the Rush Hour performance series at Hardywood Park Craft Brewery and Dominion Casual Fridays at the Virginia Museum of Fine Arts. For a full list of the concerts for the 60th season, the Richmond Symphony's website should be updated later today.